Community Flights will analyze current community air service. We’ll research and rank community air service market target opportunities. Community Flights will recommend the best airlines for flight markets. Community Flights will help find other flight support resources. We’ll coordinate the crafting of community sales points based on airline(s) target(s). Community Flights will development with the client, the airline pitch to acquire air service. Community Flights will coordinate flight support efforts with airline partners. We’ll Identify/coordinate community marketing and support organizations and resources. Community Flights will estimate the resources needed to support targeted new air service. We’ll check on the progress of achieving passenger and revenue benchmarks. 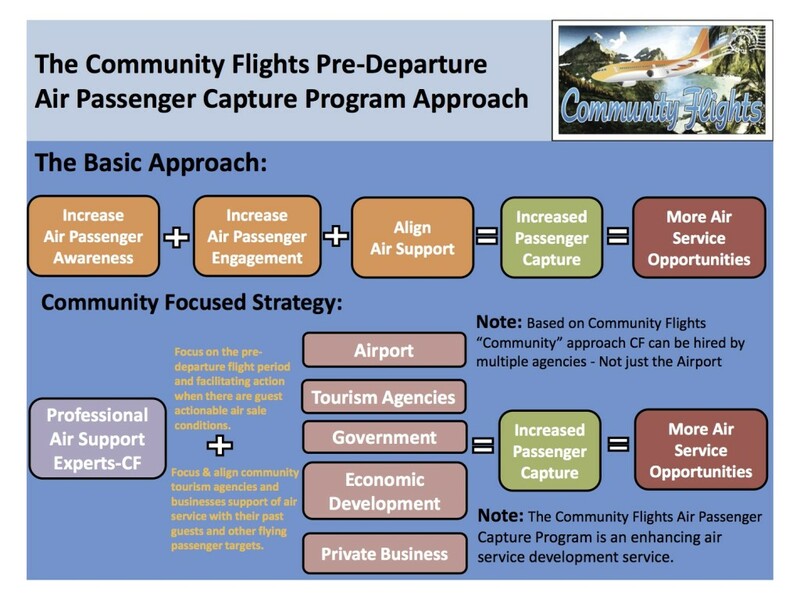 Community Flights will manage strategy/tactics to meet revenue and passenger performance goals. Community Flights will set air service passenger and revenue benchmarks. We’ll analyze current local passenger segments and inbound passenger opportunities. Community Flights will study and quantify the opportunity to move drive travelers to fly. We’ll reset strategies, as needed, to meet passenger and revenue benchmarks. Community Flights will regularly check resources and organization structure against the communities air service development efforts. “Effective air service development requires actively working in a constantly evolving airline environment. Communities should not rest on their laurels if they wish to sustain or grow air service. Rate will depend on scope of work involved. Scott Stewart is the principle of Community Flights; an air service support, development and management company. Community Flights works with communities, organizations or businesses on leveraging air service for economic gain. Scott formed Community Flights in January 2012. His goal was to mobilize community support efforts and aid clients, bridge the “air service understanding gap” with the airlines. Scott works to create an airline and community win-win air service support and performance environment. You can find more info about Community Flights at: www.communityflights.com.